Whitehill Farm Cottage01600 740253work Self-cateringFive star comfort in this attractive self-catering ancient barn conversion sleeps 6. Stunning panoramic views. Twin room and ensuite facilities on the ground floor. The first floor has master bedroom & bathroom plus twin room with ensuite facilities. 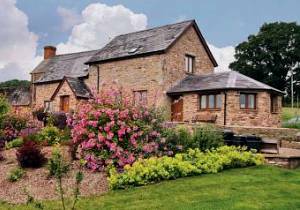 Five star comfort in this attractive self-catering ancient barn conversion sleeps 6. Stunning panoramic views. Twin room and ensuite facilities on the ground floor. The first floor has master bedroom & bathroom plus twin room with ensuite facilities. Full weeks (Fri-Fri) and short breaks (Fri-Mon or Mon-Fri) are available. One well behaved dog welcome (£20 per week). 20% reduction on the weekly rate when occupied by 2 people only. Viistors are welcome to explore the farm which is managed to protect and restore habitats and landscape features. Wild deer roam the farm. Enjoy spectacular views from our 100 sq mtr paved south terrace. This unspoilt area is easily accessible and well served by motorways. We are not far off the beaten track but far enough to provide an ideal retreat.